So Vancouver is hard to really get to see when you’re going to conferences for a week straight, but I did get to walk around and take some photos one afternoon when the sun came out — and then my camera ate the pictures, so you’ll just have to take my word for it. I walked along the waterfront, and then down to Water Street and found the John Fleuvog store, an artisan shoe shop that was supposed to be good. I was prepared to be wowed by the feel and smell of the leather, and by the design, but it was a disappointment — apparently, my tastes far outstrip my budget, to the point that I do things like travel cheaply. If it’s not a secluded five-star resort in a tropical paradise, it might as well be a hostel. As I walked, I kept thinking: globalization is not good for the particular vibe of a city. Basically anywhere you go now in the developed world, it’s gluten-free-option bistro food with a hipster twist, bearded guys with baby beer guts hidden by v-necks, bike culture, iPhones, spare-changers both with and without dogs, people selling cheap wares on pieces of cardboard, and lots and lots of black leggings. And chic Asian girls taking photos, laughing over the results with their hands over their mouths. It’s just odd how mushy cultural boundaries have been getting in the last ten years in big cities, even if you choose to ignore the Starbucks and McDonalds on every corner. Vancouver reminds me of Seattle, or San Francisco, or Madison, Wisconsin. Or perhaps it’s the feel of the weather: I’ve explored those cities in October, my explorations coinciding with the yearly US Localization World conferences. On Halloween, I cut out of the conference with three friends for about 15 minutes to experience FlyOver Canada, conveniently located at the tail end of the Vancouver Convention Centre, and conveniently priced so that conference attendees get a 20% discount. FlyOver Canada is one of those experiences that I’m not sure if I should have loved, or hated on principle. The technology nerd side of me thought it was awesome: you sit down in long rows in front of a giant Imax dome, and then the lights go dark and your seat moves forward so that your feet are dangling above the edges of the dome, and the landscape starts to roll across the screen in conjunction with the tilting of your seat so that it’s hard not to believe you’re actually flying through space. A gentle breeze blows into your face, and as you pass through clouds or the spray of Niagara Falls, real mist appears and chills you. As you fly over prairies, the smell of sun and grasslands emerges through some hidden channel. Anne-Maj pulled out her phone and started snapping photos of the scenery, towering mountains with skiiers underneath, lakes and gorges. 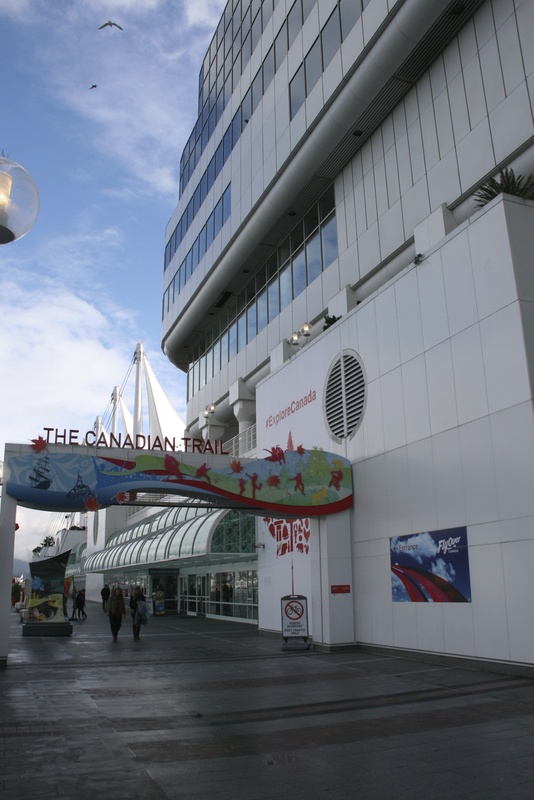 The ride, if it can be called that, takes you from Eastern Canada to the West Coast, and passes over the Vancouver Convention Centre. “Sorry we’re not working!” Courtney yelled down to the screen as we zipped overhead. We ended above the clouds, watching the Northern Lights, and then we trooped back to the conference. Nerd-me thought it was fun and beautiful and really cool, Imax taken to its logical conclusion, and outdoor-me was not happy that virtual reality was replacing the real thing. With me being a prime example, taking 15 minutes out of my busy schedule to pretend I’d seen Canada instead of going out into the rain and seeing it for real. Yes, but it sounds like you do way more “seeing it for real” than most of us. By the way, have you ever heard of the Ground Truth Trekking people? I think you all would really like each other; maybe you can look them up the next time you’re in Seldovia, Alaska?